This one bedroom duplex is characterized by bright colors, modern art, hardwood accents, and large windows and is located on the first and second floors (or American second and third floors) of this left bank building. On the upper level, you will enter into the bright and contemporary main salon. The room features parquet floors, comfortable leather couch and side chair, and two large windows with red curtains. The leather couch easily converts to a sofa bed that can sleep two additional guests. The main salon also houses an antique dining table that accommodates four to six dinners. The table sits below a large modern art piece, which compliments and completes this contemporary-styled room. Also on this level is the fully equipped kitchen. The kitchen, with all modern appliances, is styled in a black and silver motif. The room offers bar seating, clean lines, an interior window, and a Nespresso machine. Down one level is the large bedroom and small salon, also with two large windows. The room features a queen-sized bed with cushioned suede headboard. The sitting area has two bright orange chairs that add comfort to the room as well as a modernist flair. The room also supplies a small desk and chair. The adjacent room is for dressing and has a large closet with sliding glass doors and a chest of three drawers. This lovely apartment simply could not be in a better location. Two of us spent about 4 weeks in St. Germain Mabbillon, and every single day we discovered another thing that we loved about the location. It literally offers everything you could aks for of think of, and always it seemed we could access just about any kind of food, shopping, metro, parks, just steps away. We walked everywhere most of the time, but we also took the metro, which is so close. There is street noise at night and in the morning, but it was the sounds of Paris (people congregating in restaurants, street cleaners, delivery vans). It was clear that the owners actually use the kitchen because it had a wonderful variety of cooking utensils and plates. We loved the bedroom (downstairs), and having two bathrooms (a full downstairs and a toilet/sink upstairs). The one thing we found, however, was that the furniture in the living room wasn't really comfortable for relaxing. It was functional and attractive, and if we were there for a shorter period of time it likely wouldn't have been an issue. That said, we frequently visit Paris, and St. Germain Mabillon is in one of the best locations you could imagine. An amazing location. Great service from Paris for Rent. I would rent this apartment again and use Paris for Rent anytime in the future. 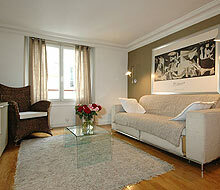 The apartment was lovely and in a fabulous location - easy for walking and close to metro lines. Also the staff was very responsive to requests for help or assistance. 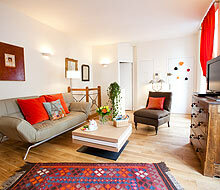 Mabillon apartment was everything as advertised, clean, tidy, well equipped and a fantastic location. The shower was great and the bed was large and comfortable. Our greeter Kimyi was most gracious and helpful, making check in a breeze. 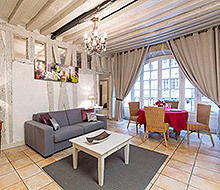 This was our first time renting with Paris for Rent and they will be our first choice on future trips. Mabillon was excellent. 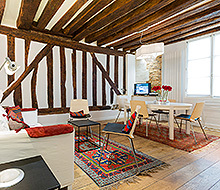 The apartment was immaculate and location was superb. Service was great. I’ve used Paris for Rent in the past and will continue in the future.